There I have said it, I had to get it off my chest. No matter what recipe I try, I can't stand the taste of wheat flour. Bitter, dry, blahh, yuk. clazar123 below has some good suggestions. *smile* But there is no reason to force whole wheat to fulfill the purpose when rye is already doing that for you. I used to have a fascination with rye decades ago, but ironically I had the same experience with it that you are having with whole wheat. I didn't know about higher hydration doughs back then, and also I insisted on following precisely the recipes with regards to caraway seeds when I don't really like caraway seeds all that much. Silly of me, but I did not feel free back then to change things like that. I could probably make a rye bread now that I would like, except that I am genuinely worried about storing rye grain. I keep my grains at room temperature in 5-gallon buckets with gamma-seal lids, but no moisture or oxygen absorbers. I scoop out enough at a time from a bucket to fill a #10 can (roughly coffee can size), from which I then take grain to grind into flour as needed. I don't know if that is enough precaution to avoid ergot poisoning. I'm with you but hubby loves it -- sigh. So, I often make it "Anadama" style by adding cornmeal and a big dollop of molasses. Gives it more taste. A lot of honey can help, too. molasses. I have accumulated about 15 lbs of the stuff and hate to throw it away. for my husband who also hates whole wheat. It's a tiny bit on the sweet side which counters the bitter taste of the whole wheat and I add gluten which gives it a lighter, springer crumb better suited for sandwiches and also extends the shelf life of the bread. In the bowl of my Kitchen Aid mixer I add the sugar, oil, honey, butter, salt and scalded milk. Beat on medium speed with the paddle attachment until the butter has melted then add the cool water and the cold eggs. Add the all purpose flour, vital wheat gluten and the yeast and beat on medium speed for 4 minutes. Switch to the dough hook and add the whole-wheat flour…mix and knead until the dough has come together very well. Place dough in pan of bread machine and select the dough cycle. When cycle has finished form 1 large torpedo shaped loaf and place it on parchment paper on a baking sheet. Spray well with cooking oil spray and let rise for 35 minutes. Bake 375° oven for 39 minutes or until internal temperature reaches 180°. Place on cooling rack to cool. When bread is completely cooled cut the loaf in half and place in two plastic bread bags. The loaf will be too large to fit in one bag. I try to get 4 to 5 uses out of each plastic bag before I toss them. Congratulations on a beautiful loaf. Who could resist that bread? I was wondering where you purchased your bread bags. 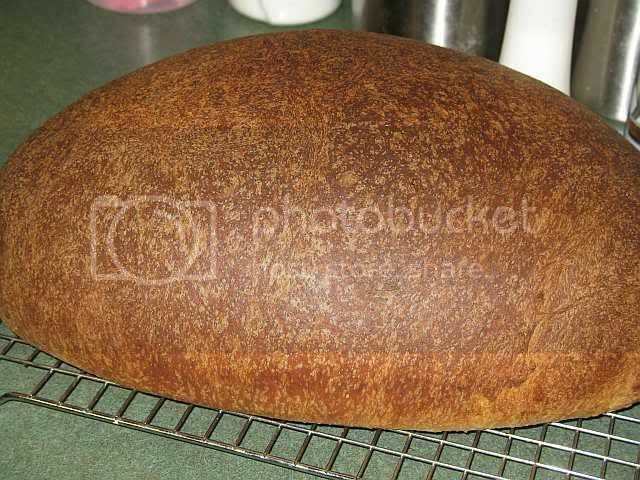 I'm looking for something that can handle a 2-lb round loaf. I see the New York Bakers site has plastic bread bags in reasonable quantities. Sam's Club sells all their plastic bread bags, also pizza boxes, everything! If you live by one, just stop in and get it there and you can save the shipping! Pretty cheap too! Awesome parchment paper! 1000 sheets for like $36 bucks! I buy 2 packs or 200 bags and that is enough to last me a year. Thanks, Faith and Betty! I live less than a quarter mile away from a Sam's Club, so I'll check it out. I appreciate the help. so the bread crust doesnt get soggy ? I am just looking for a few, i.e. 20 or 30, all seem to sell in lots of 1000 +. I just got 1000 for $25 dollars (+tax) at the local grocery store bakery. I called them ahead and they just added an extra box to their usual order. Would people be interested in having some of them? I'd like to recover my costs but wouldn't charge much. If you think you'd be interested, send me a message and I'll work out the costs. No I haven't had that problem, my sandwich bread stays fresh for days in these bags. But then the crust on my sandwich bread starts out soft. When I make lean breads with the lovely crispy crust I only make enough for one meal. I have never found a way to keep the crust on those breads crisp for more than one day. I just cut the loaf and turn it up with the cut side down and leave it sitting out on my bread board til it's gone. I keep some lean dough in a plastic bin in my frig and just pinch off what I need for that night's dinner, shape it and leave it sitting out to warm up and rise. My husband put an oven out in the garage for me to bake bread in many long years ago. He picked up an old gas range at a garage sale and he piped in gas for it so it costs next to nothing to use and not heat up my house in the summer time. It also comes in very handy during the holidays. In the humid climate of the Texas Gulf Coast, fresh baked is the only way I can have a crisp crust. Bless his heart, what a great hubby ! That is just down right pretty! That is just down right pretty! I'm going to steal your recipe... Thank you, so much! Try subbing, some or all, of the water with OJ. It removes the bite. I hate dry bitter bread-it's nasty in the mouth and hard to swallow. So I don't make that kind of whole wheat bread. Whole wheat is a whole different animal than baking with AP flour. You can't just sub out some of the AP with WW and expect it to be right-it never is. There are some standard things to do with WW to make it right and if you want, I can go into that in more detail. 1. If you are eating WW for the health benefits of whole grain, try just adding some (about 25-30%) to your favorite sandwich bread recipe. But increase the water/liquid a bit and let it soak for at least 30 min to allow the WW to absorb the liquid. 2. If you use a recipe that uses a sponge or preferment, just add the whole wheat flour to all the liquid for a good soak. 3. Use a recipe that will normally make a soft loaf-one with milk,egg, potato and a fat(oil is fine). 4. Make a recipe that is flavorful-use honey,molasses,sugar or spices. I make "Breakfast Bread and we have it toasted every day. It is a WW Cardamom-coriander-gold raisin,craisin,walnut bread. It is dense as it is designed to be toasted. Yum! I can make it softer but we found we preferred this one dense. 5. Whole grain does NOT have to be whole wheat. How about an oatmeal based bread (like a Swedish Limpa) or an Anadama bread was mentioned. Or even a Multigrain Bread-throw a little of every kind of grain in there. It can be chewy or it can be soft depending on how the grains are processed-cracked or rolled. 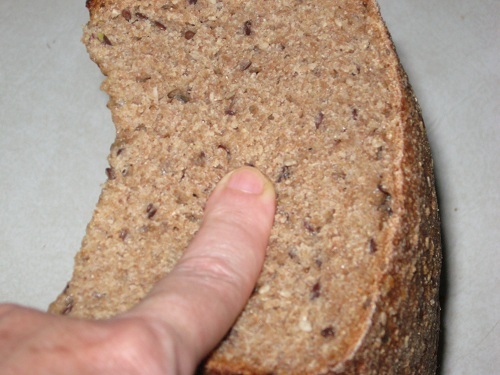 6.Try a whole grain loaf based on a water roux-wow is it soft!. So don't eat any dry,nasty tasting bread! Life is meant to be enjoyed, so it's silly to force yourself to bake and eat something you find disagreeable - at least, that's my philosophy. On the other hand, adding ten percent WW, or even a higher percentage of KAF's white whole wheat (which doesn't have the bitter taste), can bring something to the party without ruining it. I have read a bit of history on breadmaking and it would seem that throughout most time periods a good percentage of the bran was sifted from the "whole" wheat. This would make a bread rather different from what we know today as true whole wheat bread. So your taste buds may actually be steering you in the right direction. 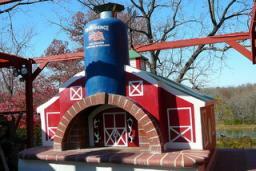 There are many mills that make a white type flour that has the bran removed but the germ is intact. You might try searching for such a flour and give it a try as I think you might really like it. The end product is more like white bread and much less like whole wheat as we know it today, yet filled with the nutrition present in the the germ. It is an acquired taste. 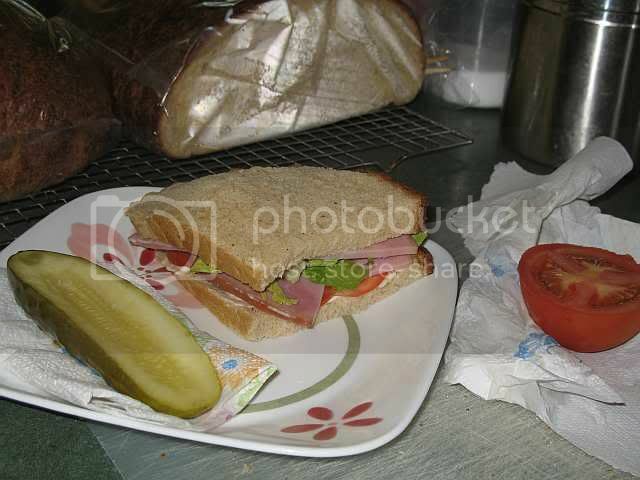 I hate ww sandwich bread that you get from the market. Although, if you use ww right, it brings a nutty richness to your bake. To start off your ww taste buds, go with a blend of white flour and a small amount of ww flour. Then, you have to raise the proportion of ww flour. When I found out I was diabetic 10 years ago, and was told the only kind of bread I could eat would be ww or rye, I almost gave up baking altogether. I didn't like ww bread then and it took me years of experimenting before I finally got used to the taste and discovered I could make a really good ww bread, using part ww and part a-p flour. There's a Beth Hensperger recipe for 100% ww bread that I made and the note I left in the book claims that it's the first all ww bread I really liked. Still, in trying to follow the eating guidelines for diabetics, I started making oatmeal bread which I love, and I poured over bread books looking for other whole grains I could use. Then a couple of years ago, someone came out with the information that an all white sourdough bread is as good for diabetics as a regular 100% ww bread is, and I was off with the starters. Oh the joy of being able to eat white bread again! I still make breads with whole wheat, rye, oatmeal, barley flour, millet, and kamut from time to time simply because I like the flavours, but it's great to be able to eat my white sourdough (which isn't even sour) and know that I'm not messing up my blood sugar. You could always try the white whole wheat flour that's available in the U.S., though not in Canada unfortunately. Anna, you probably know that I'm absolutely mad about rye and that I generally can't stand wheat bread, so I'm biased as much as you. I guess your flour is simply the wrong one, as it happened to me several times. The right whole wheat flour can give you a marvellous bread, as does mine: it's very sweet both in the taste and in the aroma it produces during fermentation. Just find the right one and you'll enjoy delicious bread. There's another idea. 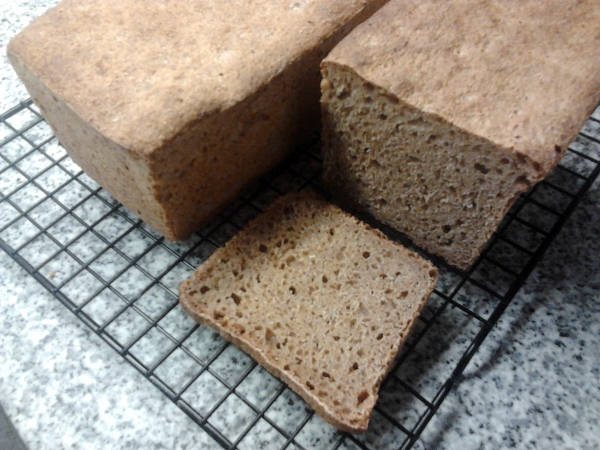 If you like rye bread but feel the need for whole grain-just add at least 20% rye flour and you now have rye!. Of course, working with rye is another totally different experience that requires different techniques but not hard to learn and you have MANY experts here, as you know. your wonderful advice which I will heed and not throw away those 15 lbs of KA WW. Good to hear that my German sourdough with rye is just as nutritious, it will appease my dear husband. I already pack most of my breads with loads of seeds, so we got the nutrition part worked out. DIVERPRO94: The pita bread recipe is a keeper ! SYD: I will try that sieve idea. 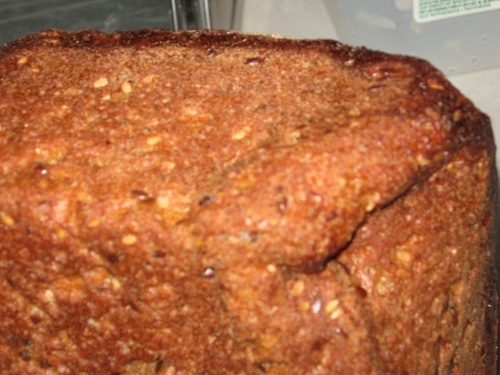 CLAZAR123: Might you share your Breakfast Bread recipe with us ? Sounds just awsome ! PADDYL: Yes, oatmeal bread is a wonderful bread, I love it. LINDYD and YERRFEJ: I believe, I can purchase KA's White WW flour here. (We are in the country, hard to purchase anything other than the most ordinary). Good to know that this isn't the bitter kind. To be redundant with another post i made, wheat gluten added to 100%WW flour breads will give you a texture closer to what you are used to with white flour breads. The taste however will still be wheaty, in which case a little honey or molasses would do you well. sorry if i repeated anythign someone said....post is to long for my young mind. I will try the gluten ! The bagged kind, that is. It's always full of rotten, rancid wheat germ which makes it so bitter. It was a real 'aha' moment for me when I was experimenting with making my own graham flour. I bought a jar of Kretschmer Wheat Germ at the supermarket, some nice wheat bran at the bulk bin (taste it first) at my local health food store and combined it with my bread flour to make my own reconstituted whole wheat flour. When I cracked open the jar of wheat germ and tasted some, it was delicious and not bitter! They pack it in nitrogen. I kept it in the freezer after that and it stayed tasty. Crider, glad you figured out what tasted best to you. Nice ! Ahh, the whole wheat. She can be a cruel mistress, but when she smiles on you... sigh... she is worth it, no? I have four loaves of WW rising right now, so if you're going to be critical just try to keep your voices down. If they hear anyone saying mean things about them they might just turn on me! They are especially jealous of the rye breads so, shhhh. I'd better go now... "coming my dears!" That reminded me of a bread I used to make at the time when I started baking more seriously - 4 years back or so. This is a mix of ww and whole rye with all of the rye from the sourdough. Mix and develop some of the gluten - it's quite sticky. Forget about shaping. Form oblong pieces and put them into loaf tins. Proof (can be 6 hours to very long, depending on temperature). Let expand, but not quite double. Bake at 230C, turning down the oven to 210 after 10 minutes. Bake 500g loaves for about 30 minutes in total. Let rest for a day before cutting. This was my first bread which fired up my German taste buds. I'll post a picture when I got one. She's just a sort of older generation people we have a LOT in UK who loves and lives on those post-war, mass-produced, white, fluffy, tasteless cotton bread. You go to a bread shelf in a supermarket and if you pick up the most unappetising loaf of mass-produced bread, and I can guarantee you she'd love you. lumos, has she tasted "real bread " ? She might become a convert. When you get a chance, tell her how much I enjoy reading about and respecting UK women, having devoured just about all of Rosamunde Pilcher's novels, their settings being mostly during WWII. I seriously doubt it. She's a typical of old generation English person who eats to live, not live to eat. I always make several loaves to take it to in-laws every Christmas for Christmas Tea table, but all of us devouring my handmade breads, she only eats her favourite factory-made, pre-sliced white bread, with margerine. (She has tried my bread, but thought it was 'too hard' for her liking...) But it's not just bread. She's not very 'adventurous' about food, and a lot of older people (and some young) people are like that here. doesn't know what she is missing with your yummy breads. I don't think it's the flour.. The colours aren't quite right - my regular camera disappeared mysteriously. 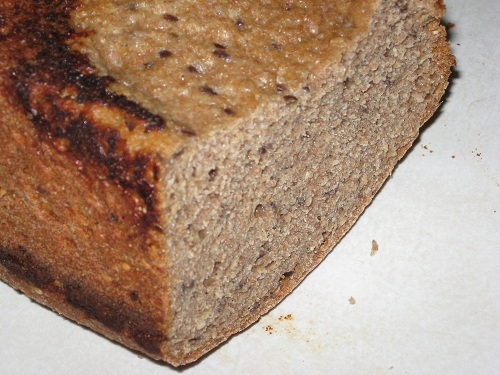 The bread is not bitter and improves day by day (at least for 4 days), the crumb is quite moist. Interesting: the dough was bitter.. I don't care for WW bread about about 30 % WW flour. I find however that by fermenting the WW flour for 24 hours before making the bread brings out the flavor while taking the curse of the WW flour. I generally make my breads pretty basic, flour water salt and yeast. I add eggs and milk to fancy rolls and sometimes malt syrup to my WW bread. 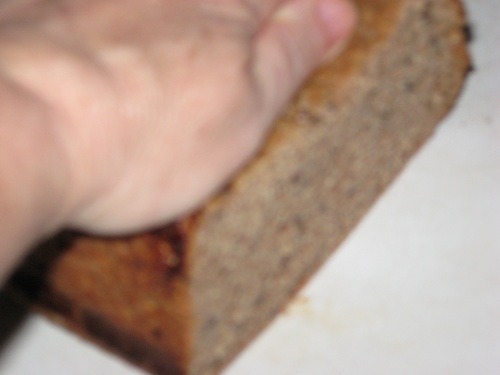 Here I pressed my finger into the crumb, and then the loaf afterward showing no damage. Here I pressed down on the loaf, and then released it. Sorry for the blurriness of the first photo. 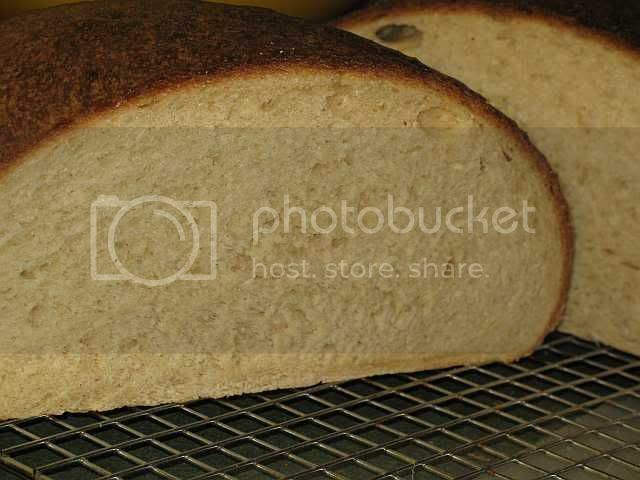 I think you can still see that the top of the loaf, which is on the bottom, is flat in the first photo and has rebounded to curved in the second photo. The bottom crust above was partly torn off because it stuck to the pan, which is evidentally not a very good pan for baking this sort of bread. In removing the loaf, I had to pry it out with a butter knife, and this crumpled one corner permanently because the inside is resilient but the crust is not. Place soaker in refrigerator overnight. Leave starter on counter overnight. Combine in stand mixer and mix with dough hook for a total of 5 minutes starting from the beginning. Let rest for about 5 minutes, while you feed the starter and put it away, then continue for another 5 minutes. Place dough in bowl coated with 1 tsp olive oil, cover, and let rise 3 - 4 hours. Stretch & fold about once an hour. Shape and place into loaf pan, greased with coconut oil. Hopefully you will choose a pan that will actually not stick to the bread, unlike the one I used. Let rise another 90 minutes or until it looks nice. Preheat oven to 450 F. Pour 1/4 cup kefir whey over the loaf. Bake for 20 minutes at 450 F, then at 40 minutes at 325 F (this may need to be 350 F if the pan is not black, or else the time longer). Ideally it should be covered for the first 20 minutes in order to make better use of the whey for steam, but my lazy method of covering the pan with an inverted identical pan did not work well with this type of pan. Next week I should be able to test this in a better pan, but it has worked this way twice now in a black Mirro pan except for sticking. I make a honey oat bread you may like. I put both rolled oats and oat flour in it but if the rolled oats bother you you can make a loaf of plain white bread substuiting 1/2 cup of oat flour for 1/2 cup of the bread flour. Don't bother buying oat flour just put a cup or so in the blender and grind it for a minute or so. the oats. Sounds great ! Will give that a try. and can see where you are coming from, and yes the suggestions are all delicious sounding, but still think I don't want to start on that slope. However bread in general has never been my big thing, my DB and Mom could sit and eat bread and butter (Or worse yet peanut butter) for the entire day, me, if I had a slice a day it was too much. I am just not a big bread eater and never have been. But show me a croissant and that is a different story. I like my bread crispy apparently, I like toast! and so far haven't found a whole wheat croissant recipe! If you don't like whole wheat, I guess there is no need to use it. This is of course controversial territory, but I absolutely don't believe in the "whole wheat = more healthy" philosophy. In many countries whole grain products are practically non-existent for the mass population. French baguettes are white, Italian Pizza is white, Italian pasta is white, rice in Japan is white. Still, these countries don't show a shorter life span or a higher rate of typical health issues. The only difference maybe is that the type of health issues of people in higher ages differ from country to country. In some countries more people get heart attacks, in other countries more people get cancer or whatever. We will all die eventually and it is just natural that this process is initiated by one or another physical process. Actually, there are signs that bread from several types of whole grain may be even harmful for the digestive system. Over hundreds of years humans have found ways how to process raw food in a way that it is digestible. Every type of food requires different processing and so does every type of grain. It must have reason that there are all the traditions. Oats are turned into flakes and eaten pure or as a cooked porridge. Barley is turned into beer. The indigestible outer parts from wheat is taken away and then it is milled into white flour to bake (sourdough / yeasted) bread, cake, cookies, etc. In the case of rye using the whole (or mostly the whole) grain is more common and it is either baked as sourdough bread or as pumpernickel. Durum wheat semolina is turned into pasta. And so on. The interesting thing about humans it that we don't have any natural food. Whe don't have a muscle stomache to eat pure grain. We don't have an abomasum like cows to eat grass. We don't have the sour stomache to eat raw meat. Many vegetable food is toxic if eaten raw (potatoes, aubergines, legumes). And even fruit, which is probably the kind of food that it is the easiest for us to eat raw, is a problem. We can only digest very small amounts of fruit sugar per day. There are even signs that if you eat more fruit sugar than you can digest our fat metabolism gets out of order and can result in overweight. So what we have learnt is to cook (vegetables), soak (legumes), dry, ferment (sourdough, yeast pre-ferments, yoghurt, beer), grill (meat), bake (bread), etc. We do the extra work to manipulate the raw food in a way that it fits with our own digestive system (which itself is also very individual from person to person). Now with all the whole food, raw food and other movements people more and more claim that all this is wrong. In my opinion they do the following mistake: They only look at the raw data. Sure, unprocessed food contains more vitamins and minerals on paper. However: How do even the highest amounts of nutritions help us if they aren't processed in a way that our digestive system can incorporate them? Furthermore, do we (I mean people in "rich" countries) even need all the nutritions? The producers of artificial food additives may disagree, but the availability of food is so broad today that it is quite difficult to get nutrient deficiency unless you have allergies or decide only to live from potatoes and nothing else. I mean, I know people who hardly eat fruit and vegetables at all and still don't show any deficiencies. So instead of only looking at nutritions, I would rather take a closer look at how well food is processed. I see it here in Germany. It becomes increasingly difficult to buy white rolls with long fermentation, three-stage rye bread and so on, packed waffles without things like soy flour, etc. It all gets simplified for the sake of producing it for less money and the quality suffers. I consider these issues much more significant than the question if a product contains 10 percent more or less Calcium or Vitamin C.
So my advice would be: If you don't like whole wheat, then just don't eat it. It only means that your digestive system tells you that it cannot deal with it. And for your own health and of course for your own enjoyement eat the bread you like. And if there are people who love whole weat and never get any digestive problems from eating it: Great! Then you maybe have another type of gut flora that can deal with it better, so keep enjoying it. Well stated, Vogel. There's a good deal of science out there indicating that humanoids required cooked food to be able to develop their larger brains and become homo sapiens. More and more, nutritional anthropologists are making the link between cooking and cognitive development in evolution. There is no population of humans that eats or has eaten a wholly raw diet, including the most isolated of hunter-gatherer tribes. That is not to say that raw foods are necessarily bad or that cooked foods are necessarily better, but the human digestive tract developed to cope with a mixed, cooked and raw, animal and vegetable diet. Yes, there are both individuals and ethnic groups that thrive on vegetarianism, but they must work harder than us omnivores to get enough calories and nutrients. Arguably, for rotund folks like myself, our modern diet is too easily digested. I am not a big fan of whole wheat or lots of grains type breads myself, I like a nice light rye, and even some of the darker ryes, and plain old white flour is fine with me. I do like some sour dough, but plain old yeast is ok too. I agree that humans, exist mainly on cooked foods, very few total vegetarian and even raw food groups in the world, they all cook at least part of the meal. Even in the deepest jungles they cook food. The food may be mainly vegetable, but its cooked first. To HeidiH, its not that food is easy to digest, its that you are an efficient digester! Or so my dr commented, he said I was simply a more efficient digester and used all the nutrients in my food. His suggestion was to eat less. Not an easy thing to do, at times, so I have to figure out balance with my intake, not so much what I eat but how much. If Ido good, I actually loose weight (I don't obsess about calories or weight, just try to eat well, but not overstuff) when I fall off the waggon and eat out then my weight goes up and so does my sugar. But it doesn't matter if I eat nothing but salads all day, or only eat whole wheat bread (like eating sawdust) if I don't get protien my sugar goes way up. I can eat small amounts of things like rice, noodles and potatoes all not on the list for a diabetic, if I have a lot of protien! But my sugars can go up even just eating protien. So that isn't the entire answer. I think our ancestors have something to do with what makes us fat, and if we had very lean times in the past, then as the ancestors got more successful etc, and had more money, we become more prone to gaining weight. My great grandmother was a very heavy woman, my grandmother, mother and many of my relatives including my brother all had diabetes, and none of us had high dollar meals for many years, but we inherited the efficient digestion of the ancestors and put all the extra away as fat. And since most of the extra comes from cheaper carbs bread, noodles, potatoes, and rice we wind up diabetic. I can remember eating plain maccaroni with butter for a meal, and I HATED it! I'm a carnivore, and love potatoes and salads but that's it! I don't like rice, am not too fond of bread (I do like some bread, just not a whole loaf at a time like some of my family) and despise rice and most pasta! Yet according to my type A blood, I should be eating more vegetables because I am a farmer type, yes I like my veggies sometimes, but not exclusive to protien. I just feel better if I eat meat. And I don't feel better eating whole wheat bread, or 7 grain or 12 grain or sprouted grains etc, they upset my stomach, and I am not fond of the taste or the mouth feel of any of them. I'd rather eat cake! Ha! I don't like it either! I made some PR rolls and put some whole wheat in it, it was good flour too, my whole family wouldn't touch it! Went to the dogs! Just finishing up my WFO and the sweet guy who's helping me bakes with JUST WW! And then there's me, mostly White! White whole wheat flour is made from hard white wheat (as opposed to hard red wheat). It doesn't contain the tannins and other substances that give red whole wheat its characteristic taste, which some people don't like. It has all the health benefits of red whole wheat. In addition to King Arthur, you might be able to find Eagle Mills brand. It is all WWW, but in addition, about 50% of the flour is "ultramilled", that is, very finely milled, which reduces the bran particles to a size that doesn't interfere with gluten formation as much as the regularly milled WW flour. This gives you a more open crumb and a better rise, if that's what you like. I have started buying some of my WW flour from an Indian market, it is good old USA white whole wheat, but is very finely milled. The Indian word for hard whole wheat flour is Atta. Soft refined wheat is called Maida. This Atta is their store brand, so I don't know who mills it, but it's a very good deal. BTW, I buy almost all my spices and seeds (for multi-grain) from there also because of the prices and quality. to find some simple KA A/P flour. But you gave me a thought. My family physician is an Indian lady and sometimes we talk baking. I will find out if she uses Maida and from where she orders it. I've ground my own wheat for over 20 years, so I like whole wheat : ) But really.... I only like it enriched. I usually put a combination of several of these in a loaf: eggs, milk powder, butter or oil, sweetener, potato flour, cooked grain like oatmeal....you get the picture. I have made lean mostly whole wheat doughs including sourdough.... and I'll eat them.... but honestly to me they taste like cardboard. But I'll happily eat a 100% whole wheat dough that's been enriched. I actually prefer the flavor of a good white bread, such as one that has had a cold rise in the fridge. I do enjoy a whole wheat loaf though, and try to eat it because it's better for our health. However - in all fairness to the poor whole wheat loaf, I have two things to say. First, one of my favorite authors, Rose Levy Biranbaum (I will always be grateful to her kind and amazing thoroughness w/The Cake Bible - I used to be the worst cake baker on the face of the earth, before her help!!!) believes that the bitterness we taste in whole wheat is because it gets rancid! I haven't read her book, The Bread Bible, yet, but I love her blog. It was a few years ago that she posted how she purchases the wheat kernels whole, then grinds them herself. I was very fortunate to find a small bag of wheat kernels at a local Indian market (different city where I now live) and did this - and there was no bitterness at all. However, my wonderful old time VitaMix is no longer, (snif, snif) and I'm not in the market for my own grinder, so I can't grind my own anymore. Second - much easier I must say - have you tried King Arthur's White Whole Wheat flour? It's my current favorite w.w. flour - very mild, good tasting - in fact, it's hard to tell that it's even whole wheat, esp. if you do half & half. This is not intended to be offensive in any regard, bud I am just interested: People keep asserting that whole wheat is "better for our health" all the time like it is a given fact. I am of a different opinion and think it is worthy a discussion what exactly makes people believe without any doubt that whole wheat is more healthy. Is it really personal experience or "only" something diffuse like recommendation of boulevard magazines or TV shows or something similar? So what I would (seriously!) like to know: What exactly do you *believe* is more healthy about whole wheat as opposed to white flour? And do you have personal experiences that supports this? To avoid any misunderstandings: At any rate I don't want to say that whole wheat is "bad". So anyone who loves baked goods made from whole wheat flour should not feel offended. Keep enjoying it! I'm rather concerned about people who don't like it, but force themselves to eat it only because someone told them it could be more healthy. was telling me that rye and unbleached A/P is just as good. Plus, personally, when I bake bread which reminds me of my home in Germany, I really don't care how nutritious it is, I just want the good and familiar taste. The reason it is healthier is because the wheat hasn't had its germ and bran removed. White flour is ONLY the inner part of the wheat grain, the endosperm. The bran and germ of a wheat grain contain the majority of fiber and a fair amount of the protein, calcium, iron, and other minerals. The endosperm is mostly just starch, though it has a little fiber and protein as well. In terms of nutrient density, whole wheat is certainly a better option than white flour. Yes, obviously it seems plausible that when you take something away from food than it has less nutritients. Like when you peel an apple it doesn't have the minerals and vitamins of the outer parts anymore. But this is only one perspective. There must be a reason why over hundreds of years people tried to get rid of certain parts of their food. Particularly when you take into consideration that in the past food wasn't as availably to the majority of people as it is now. So why consciencly "reduce" the nutritions of food and, say, make white flour out of grain or peel fruit, when you should rather take any chance to get your nutritions? Firstly, just as human beings show a great variation of skin colours, body sizes, nose lengths, personalities and talents, each individual also has a very unique digestive system. What some people love to eat can be dangerous for other people. Just take apples. Many "experts" recommend not to peel apples in order to keep all the nutritients. While this may look correct "on paper", there are people who cannot digest the the natural wax of the apple peel. If they eat the peel in regular amounts, they can get serious problems with their liver. Then take raisins. Many people hate raisins (personally I love them!). Raisins (just like plums) contain a lot of indigestible sugars. So if the digestive system of an individual cannot deal with the given amounts, it can result in for example feeling bloated. Our body than changes our sense of taste in a way that from now on it tells us that raisins aren't good for us, if we belong the the group of people that cannot properly digest raisins. And it is just the same with grain. The germ and the bran, while containing a higher amount of minerals and vitamins than the endosperm, they also contain lots of substances that are indigestible, like phytic acids that bind minerals in our gut and therefore make them not available for our bodies. Therefore, although "on paper" whole wheat contains more nutritients, it can actually be the case that our bodies can access *less* of them then when eating (well-produced) white bread where all the nutritients are highly available to our bodies. While in the case of whole rye the sourdough fermentation is enough to get rid of most of the "toxic" parts like phytic acids, this cannot be proven for whole wheat. I guess that's the reason why baking bread from whole rye meal has been a tradition for a very long time, whereas using whole wheat has only become popular since the "health" or "whole food" movement in the last 10 years or so, at least in rich countries. I mean, Italians don't usually eat whole wheat pizza and in France they don't usually bake whole wheat baguettes. Still, they are as healthy as the rest of us. Oat is a different case. It is traditionally used with the bran and turned into oat flakes. Why the different approach? Oat doesn't contain that much bran in the first place, so it is more digestible in its pure state. So it is enough to make it chewable (by making soft flakes) and endurable (by heating it and therefore inactivating fatty acids that could turn rancid). Cooking a porridge however is the most digestible option. And even if whole wheat was highly digestible: Do we even need the extra nutritions? Firstly, we have such a high availability of food in general. I strongly believe that as a person without any major allergies it is very very unlikely to get any deficiencies. The food industry keeps initiating unnecessary studies until they finally find one that *could* *maybe* give a very slight hint that some people suffer from calcium deficiency or whatever. Just to be able to sell food with artificial mineral additives for a higher price. What, however, the public doesn't get to know is that most of the studies absolutely show nothing. There are even a lot of hints that, to take the same example, consuming calcium additives can be quite harmful and that many people actually eat too much calcium. So the industry or certain "raw food cults" (yes, it is very similar to religious cults) or whatever cause a lot of fear about potential health problems, because it is very easy to use the impact of fear to sell something to them. Even if you strongly believe that you are at the verge of having deficiencies, the amount of "micro" nuritients (minerals, vitamins, etc.) as opposed to "macro" nutritients (carbohydrates, fats, etc.) is quite low compared to fruit or vegetables. So instead of eating whole wheat bread although you find it awful, you can just as well keep eating white bread and instead compensate by eating half an apple or a (cooked) carrot more a day. If you love whole what bread, of course it is perfectly fine to keep eating it, as in this case your body shows you that it can digest it. I believe that a good food processing is much much more important then the raw nutritient amounts. I consider white bread from sourdough or yeasted pre-ferments better for most people's bodies than commercial sandwich bread that is done from start to finish in less than an hour. The fermentation makes the nutritients more available, it tastes better (the best sign that something is good for you) and it also sticks less to your teeth because of the acidic value. Lastly, just look around yourself instead of reading all the "catastrophic" stories about health problems. Especially in the industrial countries, people become older than ever before. I've just read a few weeks ago that in Germenay every second new-born child already has an estimated life expectancy of at least 100 years. Moreover, people are increasingly healthy in higher ages. A 60 year old today often appears like a 45 year old has about 20 years ago. There are 90 year old people still driving cars, 70 year olds doing marathons, 50 year olds hanging around in clubs and dancing to techno music, and so on. All that *although* (or maybe because :) ) they put 2 teaspoons of sugar in their coffees, eat white bread, cake, butter, hate vegetables, etc. So overall, in spite of all the highly processed food, people are in a better health state than ever. The difference that nowadays people have the time to think about all the little details like "Oh gosh, I need to eat more healthily so I don't get wrinkles when I become 50". People became over-sensitive about these things. And of course there is the industry which smells a new market and uses the health hype to create new products. And of course the media which blows up every little piece of information (may it be true or not) into a big scandal. Unfortunately, the government follows this route and and does campaigns like "5 a day" (5 servings of fruit/vegetables a day), only 6g of salt per day, omega-3 fatty acids, whole weat cake and muesli for young school children and so on. Interestingly, more and more doctors and scientists start to believe that exactly these campaigns cause children being overweight, having diabetes with the age of 20, amongst other issues. They say that these campaigns and the exaggerated media coverage about health issues force parents to give their children food that is highly indigestible for these young bodies. I've read an intersting example just recently. Frying potatoes is the only way to destroy all the toxic substances, particularly solanine. That's why children often prefer french fries or potatoe chips instead of cooked potatoes, because the young and not entirely developed digestive system of children can handle the fried version better. When I was young, my parents allowed us to eat anything and as much as we like. It was all available. We could eat 10 pieces of cake a day if we wanted. Thus we could learn to listen to our own body. I especially ate (and still eat) by far the most in my family, still sometimes neighbours came to my mother and blamed her for not giving me any food because I was so skinny (my brother is actually much more skinny than me). When I eat to much for several days, my body regulates itself. For examply I become kind of restless and need to move outside. I don't need any calorie tables or food plans for this. So, what I want to say is: I don't want to set up any rules or anything. But I just don't like it when people force themselves to eat something that they don't like just because someone told them it is more healthy. They don't have to be right. Your own body is the best consultant you have! I am well aware of the problems with the American diet. My point was more to highlight why white flour (which is actually an innovation of the 19th century, so VERY recently in our dietary history) is not as nutritious. At the very least, the amount of fiber in white flour is very low. Fiber is absolutely necessary to prevent debilitating diseases. So while I'm certain that some people can eat whatever garbage they want and wind up, by some stroke of incredible luck, never encountering any problems...that isn't the case for most of us. I'm not singling out white flour as the Great Demon of the Western World, here. The reason Americans are, on the whole, fatter and unhealthier than pretty much every other nation in the world is a very complex issue and what you put in your body is only a part of it, but to say that it is ok to eat whatever the hell you want because nutritional science might not have the whole picture yet is like saying it's perfectly ok to play Russian Roulette because 5 out of 6 people live through a game. Most other nations in the world have cultures of food that have been established for centuries. America doesn't. We put things together from everywhere, and the combination isn't always that great. What's more, our focus is on shoveling our food down rather than enjoying it. Taking the time to eat probably has a lot more to do with nutrient absorption (micro and macro) than does the type of food you're eating. That we need to be taught how to eat again is a shame, but it is the truth that we DO, because we have no established rules other than "grab what you can when you can". Taking a look at what people eat and why is the first step toward forming a distinct food culture. About the fiber: Well, there isn't any clear proof yet that a high amount of fiber is necessary. I mean, more than the usual food already contains (white bread, white pasta, nuts, fruit, cooked vegetables etc. also contain considerable amounts of fiber). Especially old people have problems with digesting lots of fiber. It is true that high amounts of fiber reduce the digestion time, but there are opinions that it is more due to the fact that the body tries to get rid of all the toxic stuff as quickly as possible. I don't live in America, so I may be totally wrong, but a while ago I've seen a discussion about this. The main point was that when for example Europeans go to America for a while they indeed tend to "blow up", at least short term. One reason could be the following and actually you already posted more or less the same: In America people eat a lot of badly processed or very constructed food. Just take bread. When you do sourdough bread, you create acids, yeasts and even sugars by letting the dough ferment. Usual supermarket sandwich bread uses the same principle. That means they have a sweet value, a sour value, etc. The problem is that it doesn't undergo the fermentation, but instead it is "constructed" by just taking flour and water and adding sugar, high amounts of commercial yeast, artifical acids (sodium acetate or something similar), soy or lupines flour (for creating a rich protein taste). Especially soy requires a lot of fermentation so raw soy flour, which is used in a lot of fast food, is highly indigestible. While it may taste as well as the basic flavour components are there, it lacks the fermentation process that also breaks up the original structures of the raw material and makes nutritiens more available. So you could say, well-produced food is more than the sum of its parts, whereas badly produced food is only (or less than) the sum of its parts. The same goes for many other kinds of food (for example cereals, which are often just lots of badly processed ingredients loosely thrown together). However, that hasn't exactly something to do with nutritional value. The only problem is that the nutritients are not available to the body because of the missing food processing and that toxic elements aren't destroyed. Badly produced whole wheat bread is more unhealthy than badly produced white bread because whole wheat contains more toxic stuff in the first place and therefore requires much more processing to make it digestible. Then there may be a few other things. For example, I've read that in America a lot of food contains corn syrup. Corn syrup, just like honey, mostly contains fructose (fruit sugar). The problem is that the majority of people can only digest very small amounts of fruit sugar per day. If they eat too much of it, fat metabolism is highly disturbed and people gain weight. Usual white crystal sugar doesn't cause these problems, so it is better for your weight. So instead of only thinking about raw numbers (something like "this kind of food contains 10% more vitamins than the other kind of food") you should rather care about the food being well-made. So less chemical additives in food, less fast food (because it contains many additives), less cereals (this ist just pure unfermented grain with sugar and artifical additives), sourdough bread or self-made long fermentation bread instead of supermarket sandwich bread, only use heat stable fats for baking and frying (so for example don't use cold pressed sunflower oil for frying), etc. If you care for these things, it is (in my opinion) perfectly fine to eat all the things that taste good. French fries, cake, white bread, pizza, cheese and all the other things you like. Well, we do know that diets seriously low in fiber show correlation to some lower digestive diseases like diverticulitis. High fiber diets might not be that great for you, but low fiber diets aren't wonderful either. I wouldn't start eating wood pulp, but I wouldn't switch to meat-only. I absolutely agree with you that it's fine to eat all the things you love...in moderation. And that's really the key difference between Americans and people of other, more established food cultures. American meal portions tend to be large, Americans tend to eat quickly, and in general we don't pay much attention to what we're eating. If we go next door, we find that all these food cultures in Europe and Asia have truly terrible foods by the standards set forth under USDA guidelines. I mean look at the croissant, for goodness sake. White flour loaded with fat. Tasty, hardly what anyone would call healthy. Asian cultures have all sorts of fried foods, white rice (considered junk food by current nutrition standards) is a staple of the diet, etc. Obviously, what's being eaten is not a huge problem. But it is a piece of the puzzle. Do these food cultures eat these horribly unhealthy foods for every single meal like some Americans eat McDonald's several times a week? Of course you are right about some fiber being necessary. My intention was more to say that the "offical" recommendations are often too extreme. They suggest that you have to eat raw food and whole grain in almost every meal which in my opinion is totally exaggerated. Of course a lot of Japanese eat white rice, Italians eat pasta, the French eat white baguettes, Germans eat white rolls on a daily basis without becoming fat or getting other health problems. There is a difference between "white" products that are traditionally and well produced, like baguettes with pâte fermentée, and fast food that is constructed from dozens of different chemical ingredients. The croissant example is a good one. There is a difference between a croissant and a croissant. The original french croissant uses long fermentation time, butter (which is one of the best fats for baking) and hardly any additives. Thus, although maybe not containing the highest amounts of vitamins, it is a tasty and perfectly digestible high quality product than can be eaten regularly without havin a bad conscience or anything. However, there is the other type of croissants that is produced in other countries (and nowadays probably in France, too). Made with cheap hydrogenated fats that are hardly turn into trans fatty acids and other substances when being heated. Made with chemical additives to greatly reduce fermentation time and then compensated by adding artifical aroma. These type of croissants are more probably more likely to cause stomache ache or a disturbed digestion (with various consequences like weight gain). So I absolutely agree with you. Fast food is pretty bad stuff for the most time, but it is not necessarily due to raw materials with fewer nutritients like white flour instead of whole flour, but more due to the fact that fast food is produced in unapproriate ways to reduce costs. that Americans are fat because of what kind of food they shovel down ? I truly believe it is nothing but a lack of proper exercise. For so many it is 10 steps to the garage into the car. Button to raise the garage door, button to lower it. Drive-through dry cleaner, drive through pharmacy. Going to work - parking garages with elevators, office building with elevator. Drive through lunch windows. Going home, sitting on recliner, 10 steps to kitchen and refrigerator, pop something into the microwave or save that step, pick up the cell phone and call for delivery. Reach for remote. Watch TV, shuffle off to bed, to be continued tomorrow. On weekends we might push a self-propelled lawn mower "for exercise". I see your statement and I'll raise you one: Far from being all about what you eat, it is mostly about how, where, why, and with whom you eat. While awareness of what you're eating IS important, it's only important to understand that you're getting a good blend of foods and not focusing too much on any one thing. This just goes hand in hand with good living in general, though. Eating the same thing day in and day out is not only not great for you, it's just boring. The point I'm driving at is that yeah, you should pay attention to what you eat because you shouldn't be eating highly processed junk all the time. The less processed something is, the better it tends to be, both in terms of flavor and in terms of nutrients. I guess I should amend my original statement to include "you shouldn't obsess over this unless you have a serious deficiency or health issues stemming from malnutrition, either undernourishment or overnourishment, you should just be aware of it." Everyone here is already aware that paying attention to what you're eating leads to greater enjoyment so I don't think I have to say much about that. After all, we all bake our own bread. I too was considered skinny as a child, and while we didn't have excess food, now I'm considered heavy and have diabetes. My dr said I'm just an efficient processor, and process the food I do eat completly, and gain weight on a nothing diet. As for potatoes when I was a kid, I loved them, raw, cooked and most especially fried, not deep fried, just fried in bacon grease! I eat the skins on apples, but not oranges mainly because the orange skins have oils that would be poisonous and you know this by the whiff of the orange oils you get when you peel the orange. I for close to 30 some years, didn't eat more than one meal a day, and in doing that gained well over 70 pounds. So it wasn't the amount of food I consumed that caused the weight gain. More likely my body just decided that it had to process all the food more efficiently and therefore it did! And I agree that the whole food movement is a bit overboard. For instance I am not Japanese, therefore tons of soy are not good for me at all, in fact I have come to the conclusion that I'm allergic to soy, and I know darn well my daughter is, because soy based formula made her ill when an infant. We had to go to the old standby, Pacific canned milk formula. I am also lactose intolerant and have been since a baby, so that was done with trepidation, and if she hadn't reacted well to it, the next step would have been a goat or two, which is not exactly an easy way to get formula milk for a child. My aunt who was a big health nut in the 50's (long before the health movement got really big) was into soy milk, and so forth, and I refused to eat it when visiting. I also didn't like the salad dressing she used (Miracle Whip) and several other things she pushed, but mosly she was ok, and just tried to feed me better than she felt I was getting at home. But she didn't live any longer than her parents who ate what they gardened, and lived darn poor many years, and not as long as my mother her sister who as she thought didn't eat well enough and didn't feed me well enough! So go figure! I have eaten whole wheat, but not in bread, made into boiled wheat for porrige and we ate a lot of it for several years (my uncle raised wheat and we got a bushel sack every fall for about 5 years) and my mother cooked it up and we ate it. Not my most favourite breakfast and my brother wasn't really happy with it, but we ate it! Didn't taste too bad with butter on it (never margerine) and a bit of brown sugar. You are a good example of how diverse people and their needs are. My mother is a very efficient eater, too. She only eats breakfast and then almost nothing afterwards. She is slim, but she just doesn't need more. She also has a tiny stomach, so she can only eat small portions, and she cannot eat anything in the evening. I am the exact opposite. I only eat a very light breakfast, but my stomach seems to become a bottomless pit in the evening. I am sorry for reading about your health problems like diabetes. As you mentionned, it mostly has more to do with genetic disposition than lifestyle or food. What I'd like to add is that is exactly the exaggerated health fixation that can cause problems long term. If you take things like soy milk, whole wheat or whatever although you experience getting digestive problems from eating it and only because someone claimed it is healthy, than you may damage your gut flora or other things in the long run. So, you could argue that it is acutally the "healthy food" that makes you become sick. There are a lot of examples for that. I actually know persons who scrupulously followed every detail of the "whole food" doctrine. No sugar, no white flour, only self-milled grain, self-raised sprouts, 30-50% raw food, wild herbs, gochi berries. But physically a total wreck, "in spite of" the "healthy" lifestyle. And then I know a 90 year old woman who eats a two kilogram box of christmas coockies all alone and puts 2 teaspoons of sugar in her coffe and she is still in good shape physically and mentally. Of course I don't want to render this to your personal situation. Your health problems can have many causes and maybe causes that you cannot influence at all. It is just that long term fighting your own body signals is what can cause damage. You have experienced it yourself that your body tried to fight against the intake of the whole wheat porridge so it told you that it cannot deal with it properly. Anna, I just saw this post, and want to share my experience with you, too. I used to hate whole wheat breads, buying one now and then in a Reformhaus (German natural food store). They were always brittle, dryish and tasted way too "healthy". 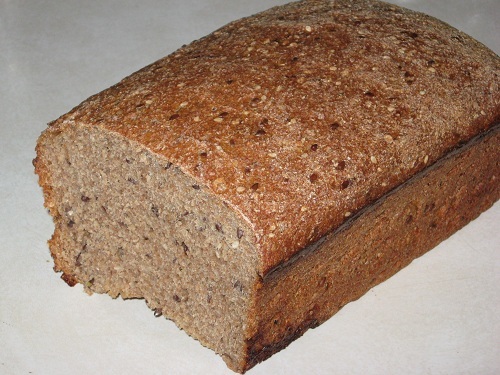 I always liked the taste of spelt better, and used whole wheat only as addition to rye bread. Only after I started baking my way through Peter Reinhart's "Whole Grain Breads", working with pre-doughs and long fermentation, I found that whole wheat breads could, indeed, taste good. As Syd and others here mentioned already, soaking the whole wheat flour makes all the difference. I soak them even longer than P. R., since for my professional baking schedule, I do all the preparations the day before baking day, and prepare the pre-doughs in the morning, the final dough in the evening, and ferment it overnight in the fridge. Even the 100% whole wheat bread does not taste bitter at all! But unlike with other recipes from WGB, where I always cut down on the sweetener, the 100% whole wheat breads need it all. I bake the 100% whole wheat sandwich loaf often, and the whole wheat pita twice a week for sale (upping that one with a multigrain mix), and they have a distinct, but very pleasant flavor, and sell very well. We baked two loaves, each with a 60:40 ratio of whole wheat to refined bread flour. We soaked the whole-wheat flour in the first batch overnight in the milk from our recipe before combining it with the other ingredients. In the second batch, we didn’t give the whole-wheat flour any special treatment and proceeded with the recipe as usual. The texture and flavor of the bread made with the soaked flour was markedly better than that of the loaf in which we didn’t soak the whole wheat. Soaking has a twofold effect on the final loaf. First, it dulls the flour’s hard, fibrous bran, blunting its ability to disrupt gluten development and produce a denser crumb. Soaking also activates enzymes in the flour that convert some of the starches into sugars, thereby sweetening the bran’s natural bitterness. The technique allowed us to pack our bread with roughly 50 percent more whole wheat than most recipes call for and still create a loaf with earthy-sweet flavor and a soft yet hearty crumb." I always dilute the whole wheat flour with all purpose white. 25% WW suits me just fine and it handles like all white flour.